Green2Go (G2G) is an online marketplace that seamlessly connects Medical Marijuana (MMJ) patients with participating dispensaries in their locality. By using G2G's online marketplace, MMJ patients gain access to a wide selection of dispensaries and their respective offerings. Patients can not only choose exactly what they are looking for from the comfort of their homes, but how they receive their order. Orders can be delivered ASAP via our on-demand delivery option, scheduled for delivery at a later time, or simply held for pickup at the patient's earliest convenience. In addition to increasing consumer choice and convenience for patients, G2G is committed to growing the business of dispensary owners. 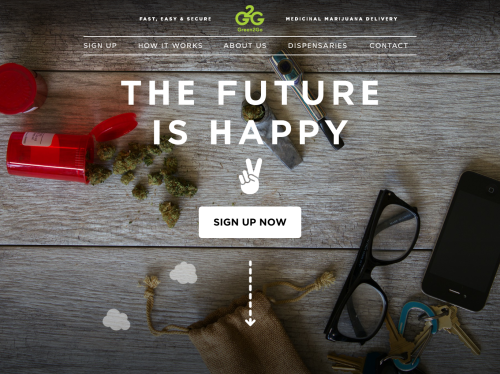 G2G will increase dispensaries' exposure to a much larger customer base, provide dispensaries targeted online and mobile advertising, and generate consumer feedback allowing dispensaries to cater their inventory to consumer demand.